If you’ve been following my Facebook Page, you have realized by now that I’m a teensy bit obsessed with the TRX Suspension Trainer – an exercise tool created by a former Navy Seal that hasn’t excited me this much since the aerobic Step was created by Gin Miller way back in 1989. When I first attended a step class in the early 90’s, I turned to my best friend and said “there’s no way in hell I’ll ever be able to do that.” In a short time, I was an avid stepper, and it’s one of my favorite exercise activities to this day. I’m telling you this because I find a lot of people are intimidated by the TRX, and I’m not sure why. Is it the way the it hangs there, in the middle of your gym floor and you don’t want to look like an idiot trying to figure out the way it works? Of course, you CAN go the conventional/normal route and just use a sturdy door frame in your house or a beam on your ceiling. Safer…..and maybe a little more sane. 2) Beginner to advanced, anyone can use it. Check out my 12 year old son…..awww, how cute is he? 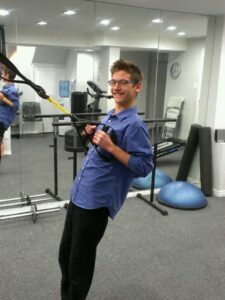 Anyhow, he loves using the TRX and found it super easy to use and understand as soon as I showed him a few moves. If a preteen can do it, so can you! 3) TRX has lots of videos to get you started. Whether you are looking for more cardio-based, strength training exercise, a more advanced military training style program, or simply to get rid of back pain and improve your posture, there’s a DVD routine for you. They even come with booklets clearly depicting the exercises shown in the DVD so you can do them anywhere (refer to Reason #1 to buy the TRX). No excuses! 4) TRX will give you the best abs. Period. Let’s just say that after having 4 kids, I’m very happy with the progress I’ve made with the help of the TRX. It not only gives you nice looking abdominals, but strengthens your entire core no matter what exercises you perform using it. Their motto isn’t “All Core All The Time” for nothing! 5) Get FREE shipping on your order. How can you beat that? Seriously, you have to click the banner above and get one. You’ll thank me, I promise. And share this post with your friends! Better yet, buy it for your friends! P.S. TRX now has another amazing product call the Rip Trainer – learn more about that HERE.